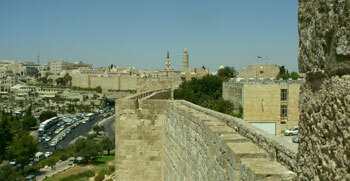 The Ramparts walk is a fun way to get an overview of Jerusalem. 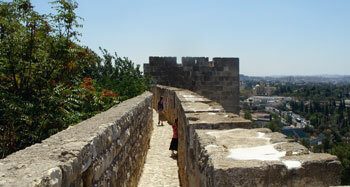 For a small entrance fee, you can climb the ramparts of the Old City and circle the city from above. Not only to you get to peek in places you’d never see otherwise – like the cloistered Armenian compound – but you also get a stunning view of the areas outside the walls. The present walls of Jerusalem were built by Suleiman the Magnificent in the 16th century, when he restored the ancient walls of the city, and they have served as military fortifications ever since. Today, the ramparts serve a more peaceful purpose as a choice destination for school field trips, tourists and Jerusalem enthusiasts. You can't circumnavigate the entire Old City in one shot, since access to the ramparts of the Temple Mount is closed off, and the road bisects the walls at Jaffa Gate. One part of the Ramparts Walk begins just outside Jaffa Gate. The entrance is a bit hard to find. 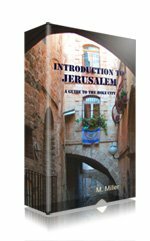 Before going through the gate into the Old City, head to the enclosure to the right of Jaffa Gate, as you face the Old City. 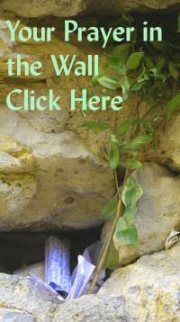 You’ll be walking between two stone walls on a stone path. Follow the signs or ask someone – the entrance is a bit of way down, around a corner to the left. 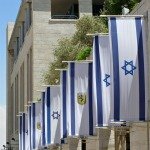 This section takes you from Jaffa Gate to Zion Gate and lets you off near Dung Gate, not far from the Western Wall Plaza and the Jewish Quarter. 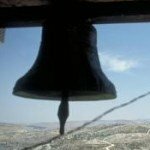 It offers a stunning view of Old City rooftops, Sultan’s Pool, Yemin Moshe, Mt. Zion and the Mt. of Olives. 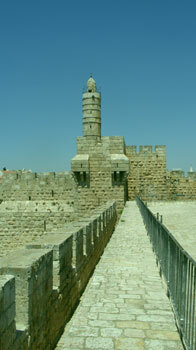 You can also access the ramparts from Damascus Gate follow them to Lion’s Gate. The walk requires a lot of stair climbing and descending. Make sure you’re wearing comfortable walking shoes, and that you have enough water with you – once you’re on the ramparts, there’s no getting off until the end and no refreshment kiosk or bathroom along the way. While the ramparts walk is great fun for adults and older kids, it’s not a suitable activity for small children, people who are scared of heights or those who have trouble walking. Hours: Sun – Thurs, Sat 9:00 – 16:00; Fri 9:00 – 14:00. 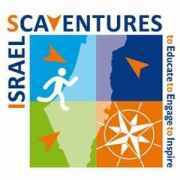 Admission: 16 shekel adults, 8 shekels children.